Appearances are deceiving, and so it is in this picture-perfect neighborhood in the Melbourne suburbs of THE FAMILY NEXT DOOR. 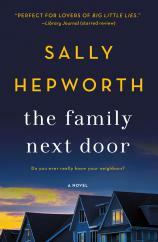 This was my first Sally Hepworth book, and it won’t be my last. I truly enjoyed the fast pace and a story that kept me wondering and puzzling about what was happening. Living in a neighborly manner, Essie, Ange and Fran aren’t really friends, but when a new woman moves into the neighborhood, the curiosity of her brings them closer. Isabelle eerily knows too much about each woman and her family. She is mysterious, caught in some fabrications and seems ever-present at odd moments. Nothing is what it appears, and while each woman has her behind-closed-doors secrets and self-doubts, each also ultimately learns that honesty and truth-telling are the route to security and happiness in their lives. “Small, perfect towns often hold the deepest secrets. "Reminiscent of fellow Australian author Liane Moriarty’s style and twisty-mystery plot, THE FAMILY NEXT DOOR had me up late into the nights reading with 'just a little more' becoming hours and chapters." While I definitely would recommend this book and thought it was a great read, I did find myself wondering why none of these women had truer friends. Outside of their neighborly socializing, it was made clear that they didn’t know each other that well, that they weren’t really friends, and there was no one else who filled that space for any of them. We need our girlfriends, we need other women to lean on and chat with, and to analyze stuff together. So this distinction between friends and neighbors --- a distant, arms-length relationship dictated only by proximity rather than joy in being together --- struck me as either sad or unrealistic. Despite that point, I found the book chock full of truisms. Certain phrases and images portray family life so vividly that I highlighted them and laughed remembering the days of early motherhood exhaustion. I found myself chuckling and nodding at the spot-on descriptions that all mothers can relate to, no matter how old their children are now. Questions also percolated as I read: Do that many marriages have these quite significant fractures? Do married couples really not communicate more openly? Is everyone in real life keeping so many secrets? Am I naïve, or is this reality? There is nothing I like more than book-inspired pondering and musings. Reminiscent of fellow Australian author Liane Moriarty’s style and twisty-mystery plot, THE FAMILY NEXT DOOR had me up late into the nights reading with “just a little more” becoming hours and chapters. The premise will hook you, and the storytelling will keep you reading and wondering until the very end.